Long before it became famous for its WWII battles, Normandy has been one of the most famous and perhaps least understood corners of France. Since the early Middle Ages, Normandy has been the site for historical events that changed the shape of European history, it has been home to some of the most celebrated artists in France, and last but not least, the place where some of the most incredible natural wonders of France can be found. Wherever you go in Normandy, every little town or village will have something interesting to show you, but nothing can quite compare to a small seaside village in Seine-Maritime: Etretat, Normandy’s coastal gem. 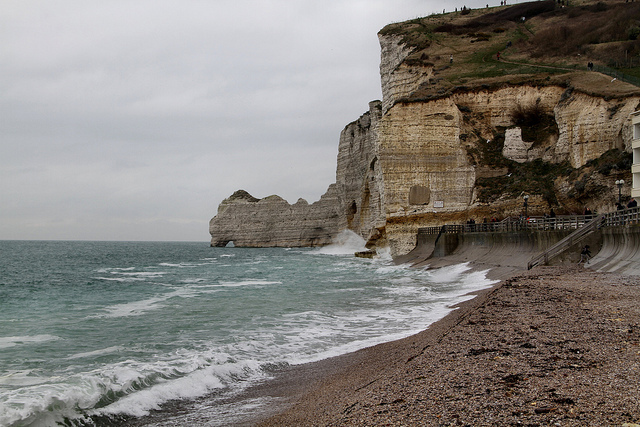 The small village of Etretat on the Alabaster Coast of Normany has been shaped and tempered by the winds and waves of the English Channel ever since it was founded in ancient times, by Vikings if the legends are to be believed. Needless to say, the village has built up a unique identity that is not limited to the incredible cliffs near it. Although most people come to Etretat to walk on the beach, the coast and admire the cliffs, there are several sights in the village that shouldn’t be missed, like the Church of Notre Dame which was built in the 12th century, with a beautiful Gothic facade. Other interesting sites include the Halles, the covered marketplace made of wood, as well as several remarkable small chateaus and villas. L’Arche and L’Aguille are two of the most famous cliff formations in Etretat, a huge rock arch created by a subterranean river, and a needle like rock tower. The cliffs have been popular for centuries, and they have been the subject of many paintings (notably by Monet), as well as used as plot devices in various French novels. 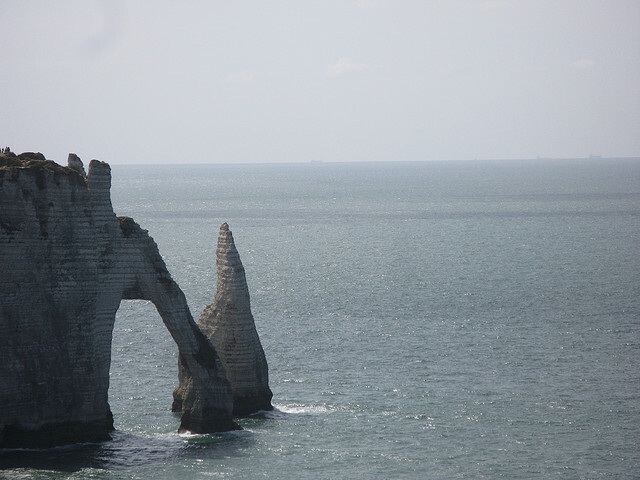 Guy de Maupassant, the French writer, described the arch as the trunk of a great elephant, plunged into the water. The Manneporte is the other very interesting rock archway near Etretat that draws thousands of visitors. 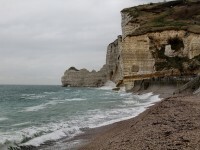 In old French, the name of the cliff meant the Great Gate, and it is larger than the L’Arche on the Aval beach. At the base of the archway, there is a cave called the Trou de l’homme, the niche of the man, where a shipwrecked Swedish sailor found shelter a long time ago. The cave can be accessed through a ladder, but be careful of the high tide or you might get stuck there until the low tide. You can climb to the top of the cliff and see amazing views of the other cliffs and the village, and visit a small cave called “Chambre des demoiselles”. 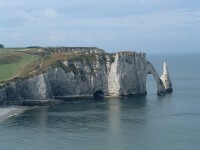 Although the Arche, the Aiguille and Manneporte are the three most famous cliffs in Etretat, there are some other smaller cliffs that are also worth visiting. On the Amont beach you can find the smallest of the three archways, the Porte d’Amont. The beaches are pristine and sandy, surrounded by cliffs and rocks, and they make a great spot for a walk.